Lightroom 3—released last week after a public beta—is the latest version of Adobe’s popular photo management software. Sometimes referred to as a “digital darkroom” program, Lightroom gives photographers the tools they need to move large amounts of images from the camera to final files, including processing raw photos and organizing images. In addition to improvements like increased speed, revamped import features, and a tweaked raw processing engine, Adobe has added some completely new features to Lightroom 3. Here’s a look at some of Lightroom 3’s best new features. 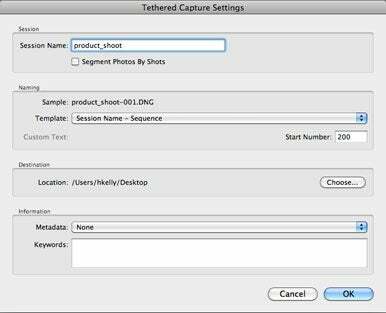 Lightroom users have been clamoring for a simple way to shoot tethered, and with Lightroom 3, Adobe has delivered. Its tethered capture feature allows you to connect a camera directly to a Mac and save the images to the hard drive instead of (or, for some cameras, in addition to) your camera’s memory card. Images show up right away on the computer’s screen for instant, full-sized previews that put your camera’s three-inch LCD screen to shame. So far, Lightroom 3 officially only supports tethering for 17 Canon and nine Nikon DLSR cameras (a complete list with caveats for certain models can be found here). Adobe plans on adding additional cameras to the approved list as they are tested. Shooting tethered is as easy as attaching your camera to your computer with a USB cable (some models require a FireWire connection), and starting a tethered capture session (File -> Tethered Capture -> Start Tethered Capture). From the set-up screen, choose any destination for the images on your Mac or network—you can even divide the shoot into subfolders called “Shots” as you go. While you’re shooting tethered, a floating window appears on your Mac showing your camera’s ISO, shutter speed, aperture, and white balance settings. A drop-down menu allows you to choose different developing presets, and a big gray button lets you trigger the camera from your computer. A fresh addition for users of the Lightroom 3 beta is Lens Correction—a feature that was rolled out a week earlier in Adobe’s Camera Raw 6.1 update. Lens Correction uses profiles of specific lenses to automatically compensate for known distortion, chromatic aberration, and vignetting characteristics of that particular lens. Since many photographers consider these “imperfections” part of the character of a photo, Lightroom gives users a slider for fine control over each of the corrections. Lightroom 3 will attempt to find the profile for your lens automatically, but if it doesn’t you can manually choose from its (growing) database of Canon, Nikon, Sigma, Sony, and Tamron lenses. 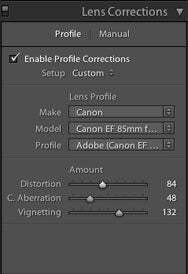 If your lens isn’t included, you can still make manual tweaks with sliders for lens distortions, vignetting, and chromatic aberration. For the many photographers who also capture video with their DSLRs, Lightroom 3 has added video import and management capabilities. From the Import screen, you can bring in video files along with your still images. Thumbnails of Imported videos are marked by a small video icon and time stamp and displayed alongside regular thumbnails in the Library section. All of your regular search and filter features will apply to videos. However, you cannot preview or edit video files in Lightroom 3—clicking on the Play button that appears when you hoover over a video thumbnail will open that file in your default video viewer. The process for getting your photos into Lightroom 3 is improved with this release, and so are your options for getting them out. Some of the welcome new features for presenting your images include exporting slideshows as video files, creating custom prints, adding watermarks, and uploading photos to Flickr. The slideshow tool allows you to create photo slideshows, complete with a synced soundtrack and title screens, and then export them as video files. The export settings offer a variety of file sizes, all the way up to 1080p. The Print screen has gained an option that allows users to create and save custom print layouts. After selecting Custom Package as the layout style, you can drag, drop, resize, and arrange images on the page any way you want. That custom layout can even be saved as a template for future use. Lightroom 3 has a new feature called Publish Services that supports plug-ins for sharing images directly with external sites. While in the Library screen, users will be able to drag and drop images they want to share online and instantly see information from those sites fed back into Lightroom. The program ships with a Flickr plug-in and more will be available soon. Watermarks are an import step in protecting your images once you take them outside of your photo management program and into the world, whether it’s as a slideshow, physical print, or web gallery. 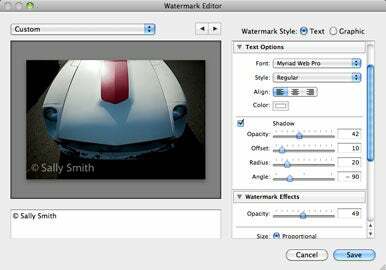 Lightroom 3 has a pumped-up watermark tool for creating original graphic or text watermarks and adjusting shadows, opacity, size and position. We’ll have a full review of Lightroom 3 in the very near future.